I love jewellery, from big dangly earrings to cute little rings. It's just another way to express myself. Anything that sparkles will always catch my eye but I also like unique pieces of jewellery. The kind that someone would comment on not because of the sparkles but because it's different. 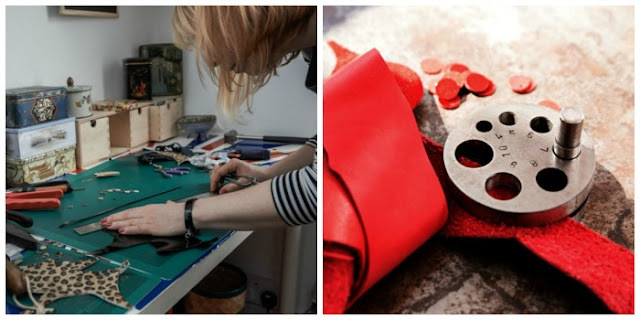 SlinkyLinks jewellery is handmade from leather by one very talented lady, Melodie. "I started SlinkyLinks in 2013 after working for a couple of years in the footwear industry. Seeing all the leather cast-off going to waste, I decided to think of a use for them. That's how I started making leather jewellery." The great thing about this jewellery is that it's not using any old leather, Melodie is using reclaimed leather. She partners with other designers who work from leather making shoes, bags or other leather goods. Because Melodies works from scraps she can only create a limited number of the same design, which means that when you buy SlinkyLinks jewellery it is truly unique. "To complement the leather, I choose good quality materials that won't tarnish over time. This allows my customers to wear my products over and over again." The jewellery is light and stylish and will go with any outfit. The clasp has three loops it can connect to, meaning you can wear the necklace at different lengths if you choose. SlinkyLinks jewellery prices range from just £10 to £60, all the jewellery available on the Etsy Store is limited so grab it while you can! Melodie also offers her services for custom orders. If you have an idea you can send her a picture and she'd be happy to create something unique for you. You can find SlinkyLinks Jewellery on Instagram, Facebook, and Twitter. 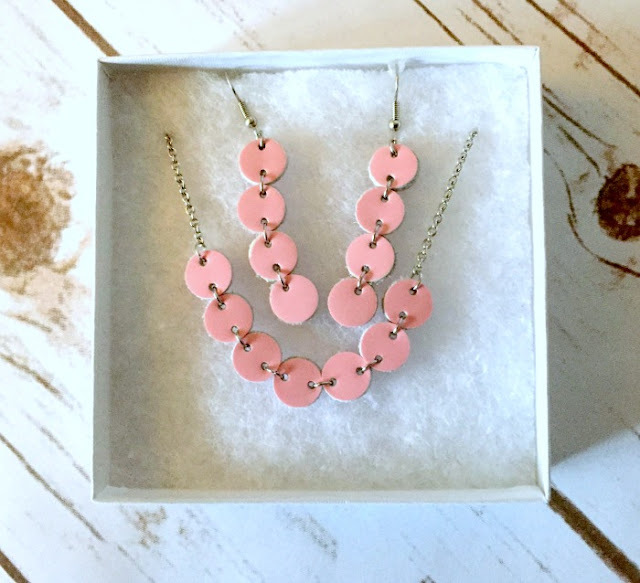 Melodie has kindly offered to giveaway the Pink Necklace and Earrings Set to one lucky Morgan's Milieu reader. If you'd love to receive the jewellery pictured at the top of this post please enter the Rafflecopter giveaway. Giveaway closes on 30th November. The winner will be contacted within 2 days. With my long black skirt and grey polo neck. What a lovely way to use something what would be wasted. A black slash-neck top & some skinny jeans. My new LBD would go really well with this!! Hi Morgan, it's nice to have something a little different in the jewelry box and something like this would make a nice Christmas present. Probably a pretty and sweet white summer dress! Have to ask the wife! With something black so that they are shown off as they should be. They are beautiful. I would go for a 60s retro-style pink mini skirt, sleeveless t-shirt and funky boots.